If you would like to set up a time to speak, please email [email protected] with the time and phone number at which you can be reached. How to Clear Cache from your browser? Register at the SoftMouse DB Registration Page to create an account. If you require assistance on Getting started with entering your colony or breeding data into SoftMouse, please visit: the SoftMouse FAQ site for tips and suggestions. If you would like to import your mouse colony data from a spreadsheet or from an existing mouse colony database application, please contact us or read additional about our Simple Data Import Tool here. In the login box, click the link "Forgot your password?" Note: To ensure that you receive emails from Iseehear, we recommend that you adjust your e-mail filtering program to include the "iseehear.com" domain in your safe e-mail list. Click these links at the SoftMouse FAQ to understand: What is an Inactive User and Why Would a SoftMouse Account Access be Deactivated. How to reactivate access to your SoftMouse FOREVER FREE account? 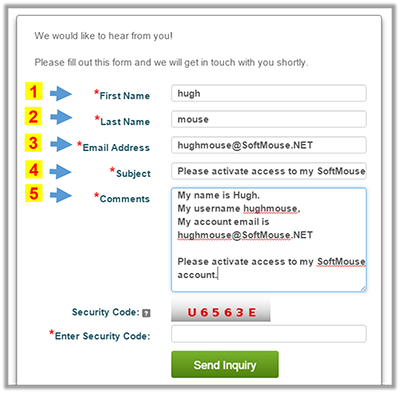 "Please activate access to my SoftMouse account"
5. In the comment field, please provide Username, Email Address. Once we receive the above information, we will reactivate your account asap! Note: if your account access has been deactivated, please rest assured that your data will still reside in the SoftMouse database. Should your account be reactivated, you will have full access to the last iteration of your data before your account access was deactivated. Have you registered for a SoftMouse account? If not please register here. If you did not provide a valid e-mail address when first creating your SoftMouse account then please re-register and provide accurate information. If you forgot your password please click Forgot Password and follow the instructions. If you are a SoftMouse FOREVER FREE user and you can not login please follow the steps in the Inactive User section. Please refresh the login access page then re-enter your username and password. Please check that you are logging in with your correct username and password. If unsure, please contact your lab account administrator or your SoftMouse Representative. Please make sure that your CAPS LOCK key is turned off when entering your user name and password. If you have 3 unsuccessful attempted logins, then on your forth attempt the Security Code requirement will appear. If you are unable to login after trying the above suggestions please contact [email protected]. Why must an account be created? 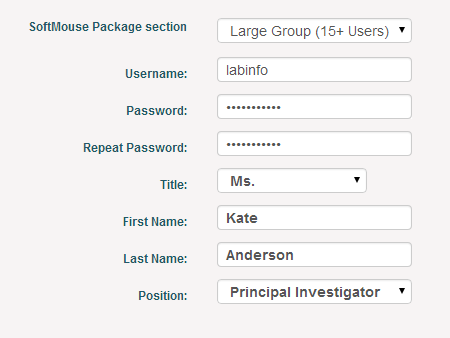 An account is necessary so that any data that you input and wish to save in the SoftMouse database will be specifically associated with your research and no one else. Simply click the button that says "Sign up 30 DAY TRIAL" or "Start 30 DAY TRIAL" or "Create an Account" or "Register". Fill in your information in the Registration Form. Begin entering data into your personal SoftMouse account. Your Iseehear - SoftMouseDB account information communicated through email may be affected by any e-mail filtering "SPAM". To ensure that you receive emails from Iseehear, we recommend that you adjust your e-mail filtering program to include the "iseehear.com" domain in your safe e-mail list. To maintain the highest levels of quality in our software, databases and data centers, Iseehear must periodically perform scheduled system maintenance and upgrades. The Scheduled Upgrades or System Maintenance Procedures assist us in ensuring the relevance, security and performance of the Iseehear systems. During Upgrades and System Maintenance Procedures, access to your account will be temporarily unavailable. Scheduled Upgrades or System Maintenance Procedures are conducted on Friday and / or Saturday evenings during our regular maintenance window between 9:00 pm and 3:00 am EST (Toronto) in order to minimize inconvenience to our subscribers around the world. Note that major version upgrades may require an extension to the regular maintenance window to ensure a successful upgrade. Iseehear will provide advance notice of Scheduled Upgrades or System Maintenance Procedures to ensure subscribers have sufficient time to plan and prepare for the temporary service interruption. Application access will be temporarily unavailable in order to execute the Upgrade or System Maintenance Procedures. Scheduled Upgrades or System Maintenance to applications will not affect the data that you have entered into the system. Important: During Scheduled Upgrades or System Maintenance Procedures, access to your account will be temporarily unavailable. Emergency Upgrades and System Maintenance Procedures are unscheduled procedures performed in order to keep the Iseehear systems and services performing at first-in-class service levels if a server issue is noticed. Iseehear will post a notice message to the Notice Board section on the login access pages and on the Iseehear Blogs and Iseehear Twitter account. Subscribers will also receive an emergency maintenance notice email informing them of the unscheduled event. Iseehear will keep you informed of our progress and estimated time to resumption of affected systems and services. Emergency Upgrades And System Maintenance Procedures will be posted on the Notice Board section on the login access page, on the Support Desk Blogs and via Support Desk Twitter posts. To learn more about Emergency Upgrades And System Maintenance Procedures, click here. To learn more about Disaster Recovery & Research Continuity, click here. A Site Maintenance Page indicates that system maintenance procedures are in progress. During this procedure, your account will be temporarily unavailable. SoftMouseDB is compatible with the following Internet browsers: Chrome, FireFox, Safari and Edge. We recommend the use of one of these supported browsers for an optimal workflow experience with your SoftMouseDB account. Please follow the links below on how to clear your browser’s cache. How to clear cache from your Chrome browser? How to clear cache from your Firefox browser? How to clear cache from your Safari browser? How to clear cache from your Edge browser? The only hardware requirements necessary to access SoftMouse.NET is a desktop or laptop computer running Microsoft Windows or an Apple MAC. These devices are certainly more on the pricier end. That said, if you are looking for timely feature updates, Operating System (OS) updates and security updates, we strongly recommend going with a brand (Apple, Google or Microsoft) that has full control on timely OS updates. Please review SoftMouse browser requirements. There is of course an array of other Android tablets, e.g. tablets using customized versions of the Android operating system (Lenovo, LG, Samsung, Dell, Huawei, Asus, …). Please be aware that for Android tablets not provided by Google directly, features are not updated regularly, the operating system is not updated regularly and security patches are not updated regularly. For this reason, we don't recommend non-Apple, Google or Microsoft devices. If you would like to discuss these options further, please do not hesitate to contact us by email or on our office line 416 492 4358 and we'd be happy to go over the options in more detail. The documents you can download from our web properties are saved in Adobe's Portable Document Format (PDF). You will need Adobe Acrobat Reader Software installed on your computer to be able to read or print the documents. The Acrobat Reader can be downloaded free from Adobe. If you are experiencing any problems with loading or navigating this website, please report any difficulties or provide us with your feedback at [email protected].